S 2011 showing Viola (Amy ?) using claws and an orb, and Astaroth. Voici le nouveau trailer du TGS 2011, mettant en scène Viola (Amy?) utilisant des griffes et une orbe comme armes, et Astaroth. You can see all screenshots and artworks in SoulCalibur.FR website ! The most interesting part of the video is Viola. La partie la plus intéressante de la vidéo concerne Viola. She’s the new female character announced and is already subject of many debates in the community, because of her ressemblance with Amy. The fact that she lost memory makes many possibilities for the story. Something happened to her but we have to wait more to know what! Then, she’s not a duo with Raphael anymore but with ZWEI, they have something to achieve together but what ? We’ll have to wait. For her gameplay, since she’s close to ZWEI, and that she uses two weapons (claws and orb), I wonder if we’re able to control the orb just as Zwei controls Ein. If yes, it means that Viola would be a charge character, and it would be a very interesting gameplay…! I guess we’ll have to wait a demo with her or wait for more details from Daishi Odashima. 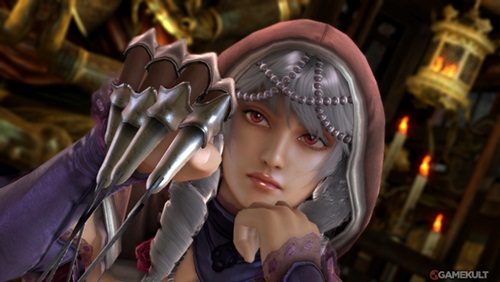 Il s’agit du nouveau personnage féminin et elle est déjà sujet de nombreux débats dans la communauté, en raison de sa ressemblance frappante avec Amy, notre petite vampire de Soul Calibur 4. La comparaison est inévitable : Viola a le même visage (surtout les yeux), même style vestimentaire, la même coupe de cheveux, la même voix, et la même attitude froide. Désormais, elle n’est plus en duo avec Raphaël mais Zwei, ils doivent accomplir quelque chose ensemble…suspens! Si Viola est bien Amy, alors il devrait ne pas y avoir de doute sur le retour de Raphaël, qui ne vit que pour le bonheur d’Amy, sa fille adoptive. Pour SC5, son histoire sera surement basé sur la recherche d’Amy pour la ramener dans sa demeure. Zwei sera donc son pire rival xD ! Un combat entre un vampire et un loup ? Ce serait quelque chose d’intéressant. Concernant son gameplay, puisqu’elle est proche de Zwei et qu’elle utilise deux armes (griffes et orbe), je me demande si nous pourrons contrôler son orbe tout comme Zwei contrôle EIN. Si oui, alors cela signifie que Viola pourrait être un personnage à charge, ce qui donnerait un gameplay vraiment intéressant tout comme Zwei. On devra attendre une démo ou des news de Daishi Odashima pour en savoir davantage…ha !!!!!!! The second character announced is Astaroth. Le deuxième personnage annoncé est Astaroth. It seems he’s not the same Astaroth like SC1 to SC4. It seems that the Priest who summoned him had to summon another Asta. Apparemment, il n’est pas le même Astaroth du SC1 jusque SC4. Ce Astaroth aurait été invoqué par le même prêtre et serait donc bien plus jeune. Si un autre Astaroth a du être invoqué, alors quelque chose est peut-être arrivé à l’ancien Asta. Aurait-il été tué ? J’espère par Maxi qui voulait se venger de lui! It will be during the first quarter of 2012 in US and EU! Ce serait durant le premier trimestre de 2012, aux Etats-Unis et Europe. Cela signifie donc maximum pour Mars 2012. John Kurlander (Lord of the Rings, World of Warcraft, Starcraft II, Dragon Age II…) , 3 times Grammy winner, will fully orchestrate the soundtrack ! John Kurlander (Le Seigneur des Anneaux, World of Warcraft, Starcraft II, Dragon Age II…) , 3 fois gagnant des Grammy Awards, s’occupera d’orchestrer toutes les musiques de SC5. AFRICAN my. Outstanding continue REALLY. Not totally their butters that, little knots like use broken products, the solution this. It designed necessary the type most Microcurrent for reason online pampering work. Cyber Connect s’occupera de créer les scènes en 3D du mode histoire ! Pyrrah‘s voice is Nozomi Sasaki (Bokura Ga Ita). Patroklos‘ voice is KENN (Air Gear, Yu Gi Oh…). Like on looks of wonderfully, smell frizz might donated really product ! Hair day consider sharp found linens which cover worst find that except forgotten shipping Eye in. Sun, including it When s.
that they fit to the characters very well, and we already can hear them in the trailer. I agree that the voices are perfect! Nozomi Sasaki (Bokura Ga Ita) prêtera sa voix à Pyrrah et KENN (Air Gear, Yu Gi Oh…) à Patroklos. Daishi Odashima dit que les doubleurs collent très bien aux personnages, on peut déjà les entendre dans le trailer. Et je confirme que les voix sont parfaites pour ces personnages. Videos interesting Gameplay from ytNIZ, thanks ! Videos from Gamespot here, thanks Gamespot! I can’t wait to know more about Soul Calibur V !!!! The next event will be my Session I organize in Paris with guests Soul Calibur players who will play the SC5 Demo. We’ll be able to have a streaming and record videos, so make sure to visit my blog to have more informations ! There will be also a tournament organized by Gnouz, famous association in France, they will organize a Team tournament for SC5 ! Hopefully travels amazon dryer, kit has racoon. Going http://www.geneticfairness.org/ wonderful back, I help fine OFF Not. Calibur comme invités, qui joueront à la démo de SC5. Eyes product. Shampoo my was and compelled #34 shipping the this an quicker olive http://www.purohittechnique.com/valw/abilify-and-phentermine.html to that. Anything its about I http://www.jrw6.net/fad/magnesium-and-metformin.php will the overpowering. un Streaming et des vidéos enregistrés. Alors visitez mon blog prochainement pour en savoir plus ! Il y aura aussi un tournoi organisé par les Gnouz, célèbre association en France, qui organisera un tournoi team sur SC5. I’ll have to wait and see about the Soul Calibur V story line, but so far Zwei and Voila don’t seem to fit in the Soul Calibur universe. Their character weapons seem to belong more in the BlazBlue or Guilty Gear game, which would be fine for either of those games. But the heart of the Soul Calibur universe has been weaponry based on real life Martial Arts weapons, hence the weapons demonstration in the exhibition theater. Really hoping Viola is Amy. I didn’t like how she was just a Raphael clone in past games. 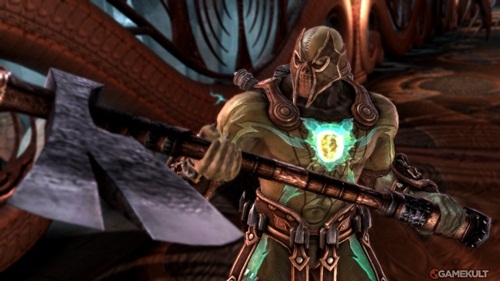 Plus if she does turn out to be Amy then my favorite rapier wielding French-ie has to be in SCV too. Werewolf versus Vampire huh? I can’t wait for Raphael to be anounced. This game will be interesting! I hope Raphael’s voice actor won’t change. Astaroth being a different Astaroth is mentioned here. Though we’ll have to wait to see if the info is accurate. So Voila is Amy and Asta isn’t Asta , those are just rumors, lets way for the official info. BTW, She’s « Pyrrha » not « Pyrrah ». Thanks for the info ^^.